This was a full Saturday for Evelina. She made a large batch of soap and was quite pleased with the result. 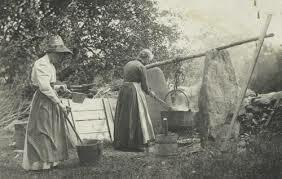 Soap-making is an art, and Evelina was good at it. She knew enough about it, indeed, to be grateful for her own success. Of course, she could have purchased soap in the city or, perhaps, even in the Ames’s general store, but the farm girl in her resisted spending money on something she could make herself. Lydia Maria Child, author of The American Frugal Housewife, devotes a whole page of her slim volume to making soap. “In the country,” she states unequivocally, “I am certain, it is good economy to make one’s own soap.” She offers various measures of ingredients: “To make a barrel of soap, it will require about five or six bushels of ashes, with at least four quarts of unslacked stone lime,” after which “[t]hree pounds of grease should be put into a pailful of lye.”** The trick to making soap depended on the sequence in which the ingredients were mixed, and at what temperature. It was a backyard chemistry experiment. After the hard work of soap-making, in which Evelina was no doubt assisted by a servant, and an afternoon of mending, Evelina and her daughter Susan went to see her nephew. Augustus had fallen quite ill two weeks earlier with fever, but was now on the mend. It’s too bad that Evelina did not give us her recipe. I suppose you were thinking of making some soap? !